Sales Territory Map® was designed by Analytics In Focus, leaders in providing sales territory alignment services and consulting. 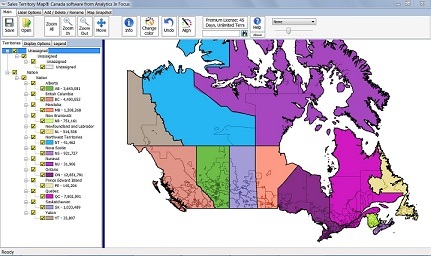 The Sales Territory Map® software allows sales management and/or sales operations teams to do their own territory mapping and design, a critical component of the sales territory alignment process. Sales Territory Map is also used by franchisors for franchise territory design and franchise territory mapping software. *The 2011 Census Forward Sortation Area Boundary File portrays the boundaries of 1,621 forward sortation areas derived from postal codes(OM) captured from the 2011 Census of Population questionnaires. © Postal codes and the shapefiles of the forward sortation areas are copyrights of the Canada Post Corporation. by Analytics In Focus, LLC. ©2009-2014 by Analytics In Focus, LLC.